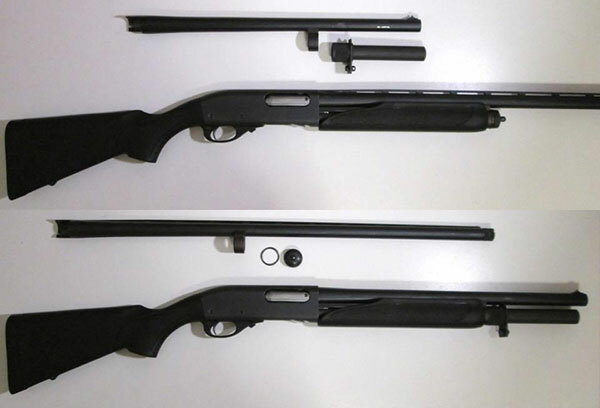 Wilson Combat, through the Scattergun Technologies brand that they acquired in 2000, produces and sells a line of aftermarket +1 and +2 magazine extension kits for Remington shotguns. Intended specifically for duty and defensive use, they can be found on Wilson Combat’s own high-dollar custom combat 870s, as well as guns from other custom builders such as AI&P Tactical. Competitively-priced and proven in law enforcement applications, these extensions have become quite popular, and are often among the first kits to be considered by 870 owners planning a build. I’ve owned and used a Wilson Combat +1 extension for some time now, and was eager to evaluate the +2 since it’s intended to be paired with the 18/18.5” barrel lengths that are by far the most common on combat/defensive 870s. The core of the magazine extension tube is constructed from separately-manufactured base, tube, and end cap parts that are permanently attached to form the single-piece unit. Some competing single-piece magazine extensions are machined from a single piece of stock for added strength and durability; but the Wilson Combat extensions seem to be put together very securely, with plenty of surface area involved in each joint. 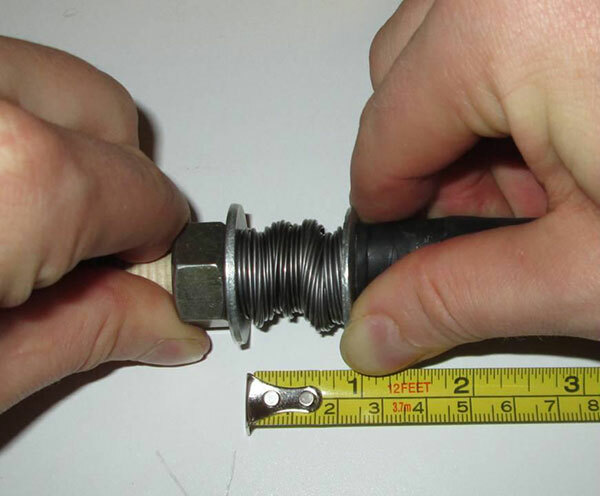 In the event of extreme abuse, I would expect the threaded joint between the extension and magazine tube to fail long before any of the joints in the extension itself. The extension’s cylindrical base is 1.125” long and just under 1.3” in diameter. Most of the base features very well-done knurling that is deep, sharp, and provides an excellent grip for removal and installation by hand. 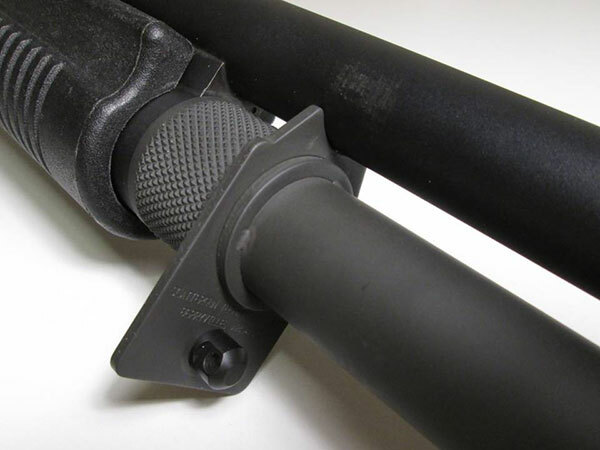 This knurling is one of my favorite features of the Wilson Combat extensions; a big advantage of single-piece magazine extensions is their simple and straightforward installation, and having to pack along a wrench or pair of pliers because you can’t get enough of a grip to properly tighten or loosen one of these extensions kind of ruins that. Any magazine extension can potentially get stuck and require tools to break loose, of course, but with the Wilson Combat extensions, you’ll practically take skin off before your fingers start slipping. I wish all my magazine caps and extensions featured such a positive grip surface. The base is dimpled on the bottom to engage the magazine cap detents on barrels that feature them. These dimples are placed at the correct radius to align with the detents (on my barrels, at least) and they engage very positively. Radial dimples like these are also used by factory 870 magazine caps, so credit to Wilson Combat for sticking with a proven concept rather than trying to reinvent the wheel. Inside, the magazine extension’s base can accommodate 11/32” (.34375”) of the threaded end of a magazine tube, plenty to allow the extension to be properly tightened down against the barrel guide ring on properly-made 870s and clones, though in most cases there will be some extra space left over. In addition, there is a small amount of space between where the female threaded portion of the base ends, and the actual extended tube section begins. This machined lip inside the extension’s base has a larger internal diameter than that of the extended tube, effectively widening the gap between the two tubes. Forward of the base, the extended tube section has a standard 1” outer diameter, making it compatible with a wide variety of clamp-on accessories, and is closed off at the front end by a slightly rounded cap. 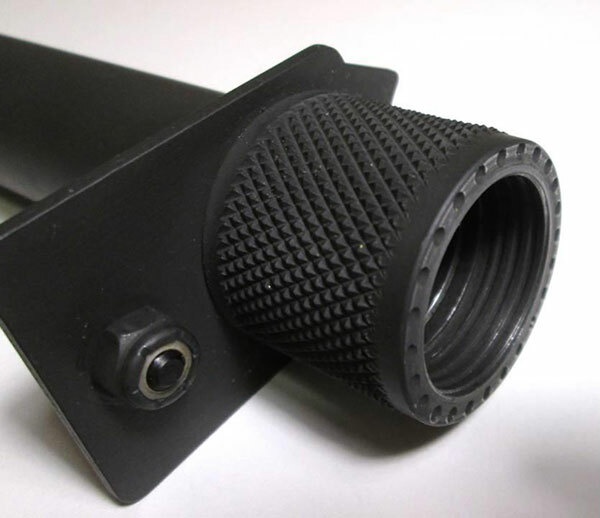 In the center of the end cap is a quarter-inch vent hole that allows air to move in and out of the tube to reduce pressure drag, provides a point where any water (or other liquids) can quickly and easily drain out, and allows a dowel or rod to be inserted to control and align the magazine spring during assembly and disassembly. Alternatively, this hole can be plugged with a sling stud or a cap screw. Overall, the magazine extension tube is just a hair under 6.25” in total length, meaning its end will line up with the muzzle of an 18” barrel – or will be a half-inch back from the muzzle of an 18.5” barrel – when installed on a standard 870 with a 4-round base magazine tube (barrels for which should have 11.75” between the breechface and the front of the barrel guide ring). Since this is a single-piece extension, it indexes from the front of the barrel guide ring, and installing any under-cap accessories beneath the extension will shift it forward by the thickness of the accessory. As a single-piece design that requires no reinforcing clamp or bracket, a Wilson Combat +2 can be readily installed on 870s with nonstandard magazine tubes. 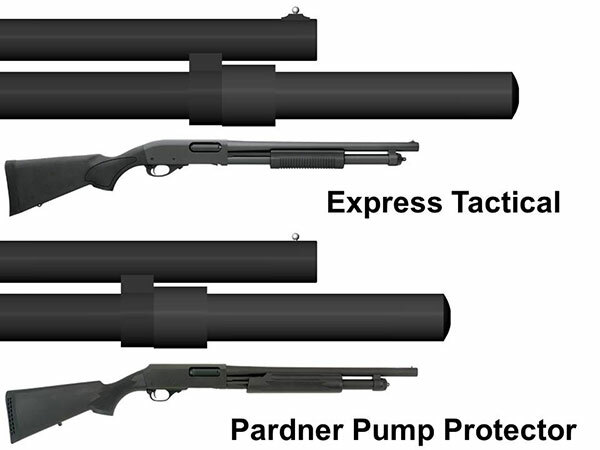 The H&R Pardner Pump 870 clones with 5-round magazine tubes have barrel guide rings about 15” from the breechface, and the newer 870 Express Tacticals with 6-round magazine tubes have barrel guide rings located 16.5” from the breechface. 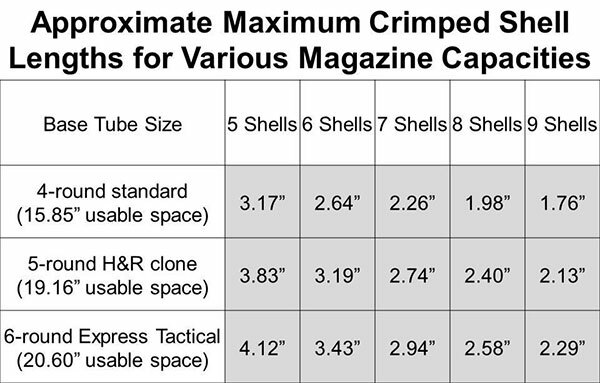 So, if installed on a Pardner Pump Protector or long-mag 870 Express Tactical – both of which have 18.5” barrels – a Wilson Combat +2 will extend roughly 2.75” or 4.25” past the muzzle, respectively (note that these measurements don’t account for extended choke tubes). 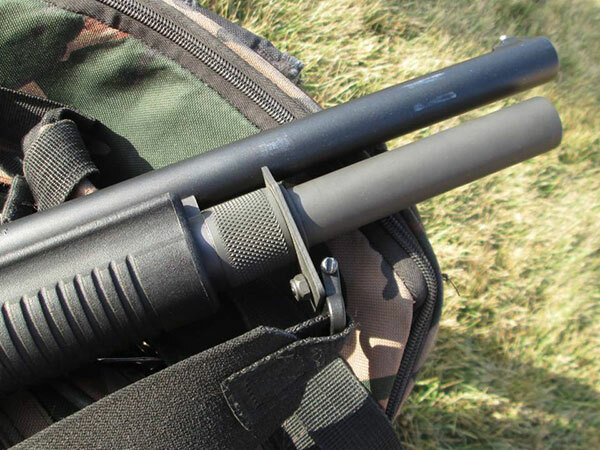 Some folks might be turned off by the look, but allowing a magazine tube to extend a handful of inches past the muzzle should cause no functional problems – it’s quite a common sight on competition shotguns, in fact. 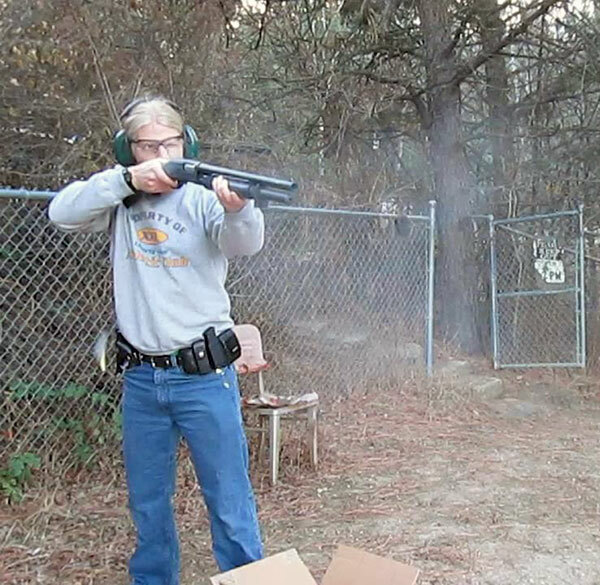 Normal shotgun shot doesn’t spread fast enough to actually strike the tube (though the end of the tube will tend to pick up powder residue), and the sling plates available on Wilson Combat extensions only need about 1.25” of barrel length ahead of the guide ring to engage properly. All Wilson Combat magazine extension kits include a new magazine spring sized for the longer-length magazine tube, and replacement springs can be ordered on their own from Wilson Combat’s website for $8. 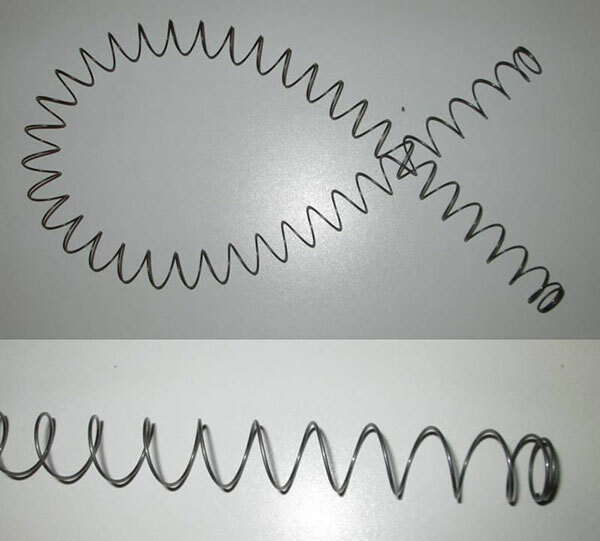 These spring are variable-diameter or “beehive” types; starting at .65” in diameter at the ends, the coils quickly grow to a larger OD of .76” in the middle. 27” long when relaxed, The Wilson Combat +2 spring can be compressed to as little as .75” for a high solid length ratio of 36. This impressive compressibility is possible because the narrower end coils can recess into the larger central coils, while the central coils are large enough to easily stagger and overlap. The trade-off is that this spring will not function properly with most cup-style followers. The central coils are too wide to fit inside such followers, and will tend to stack up on the rim of the cup instead, cutting down on capacity and dragging noticeably on the inside of the magazine tube. A solid-bodied follower with a spring-centering tail will function best with this spring. If you want to put together a maximum-capacity setup with a cup-style follower, you should probably replace the spring as well (though in a pinch, the spring seems strong enough to overcome the added drag). With the Remington 870 magazine extension tube installed on a standard 4-round magazine tube with .3” of thread engagement, the Wilson Combat spring produced an empty force of 2.625 pounds with the included follower. This should be plenty of force to ensure reliable function; it may even be a bit high for some. With the spring’s long relaxed length, you have room to trim it if you find it to be overly stiff. If you do shorten it though, I’d recommend removing coils from one end only, and installing the spring with the cut end toward the muzzle. This will preserve the narrower-diameter coils on the other end to properly center the spring on the tail of the follower. If the Wilson Combat +2 is installed with the included spring on a 5-round Pardner Pump or a 6-round Express Tactical, I estimate that the empty spring force will be reduced to roughly 1.5 lbf or 1 lbf, respectively (based on compressing the spring to the approximate length it would be in those magazines). This would likely be enough force for proper feeding in most cases, but because the Wilson Combat extensions have constant internal diameters, there should be no issues with using any alternate magazine springs to increase spring force with a longer magazine tube. The followers included in Wilson Combat extension kits are of the tailed variety, with solid bodies. The tail is intended to center the spring and stabilize the follower, and is just under 1.1” long, and about .54” wide at the base. The body is .9” in diameter and .53” thick, with a filleted front edge and a sharp rear edge. In the center of the follower is a raised post that makes it easier to tell by feel when the magazine is empty. The follower is constructed from a high-visibility green polymer that stands out sharply as a clear visual cue when the magazine is empty. I was unable to find any information on the exact polymer used on Wilson Combat’s website. Brownells describes it as nylon on their page for full Wilson Combat extension kits, but then claim it’s made from ABS on the page for the follower itself. Whatever it is, it seems reasonably sturdy, though not as smooth or slippery as the materials used in some other aftermarket polymer followers. Before obtaining the +2 extension for this review, I had purchased a used Wilson Combat +1 extension, and I was not impressed with the follower that came with it. The tail was overly long for the +1 spring and noticeably crooked. The post in the center could crack open shallow shell crimps with repeated loading & unloading, and its attachment to the body of the follower was structurally weak. With no center hole or side cuts, the tight-fitting follower experienced significant pressure drag if the extension’s vent hole was plugged. Finally, while Wilson Combat’s site claims that these followers are fully-machined, there are clear mold marks on the outside, and a substantial internal void where the tail meets the body. When I received the +2 extension kit for this review and saw that it had the same follower with all the same problems, I was less than excited. However, it’s not all bad news. 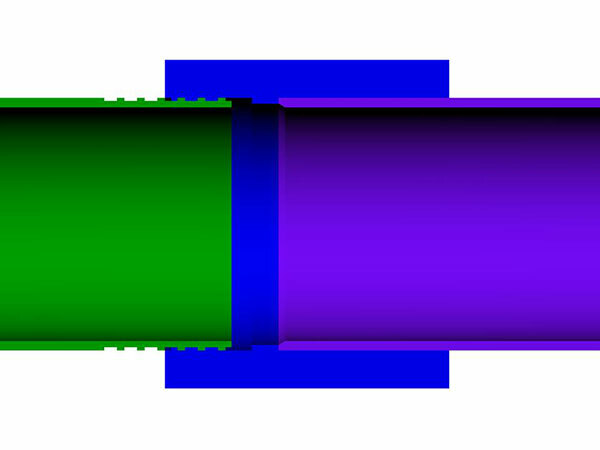 The tail’s length is a much better fit in the +2 extension, coming to rest against the end of the extension just as the spring is about to reach full compression, thus preventing the spring from being crushed if the user loses count while loading, or intentionally tries to force an extra shell in. The tail’s diameter is a good match to the spring’s narrower end coils, so the spring stays centered where it can’t hang up against the tube wall or impart a torque on the follower; and the fact that the tail is slightly crooked is less of an issue thanks to the spring’s wider central coils. And though it’s not as strong or slippery as other aftermarket polymer followers, the Wilson Combat part does not drag too severely, and seems perfectly capable of standing up to the minimal friction and very specific forces it’ll experience inside a magazine tube. As for the problematic center post, its weak structural support makes it quite easy to simply snap it off and be rid of it. The hollow area that remains still makes it easy (easier, in my opinion) to tell the follower apart from a shell by touch; and with the post gone, a passage is opened up through the hollow tail that helps to relieve pressure drag if the extension’s vent hole is closed off. At the end of the day, I would consider this follower to be quite serviceable – especially with the center post removed. Though there are probably better-made alternatives on the market, they don’t really do anything the Wilson Combat follower can’t do well enough. You can certainly upgrade if you like, but if you just need something that works, I wouldn’t consider it necessary to spend additional money on a separate follower. The Wilson Combat +2 has about 5 5/8” of internal tube space as measured from its bottom face to the internal end of the tube. 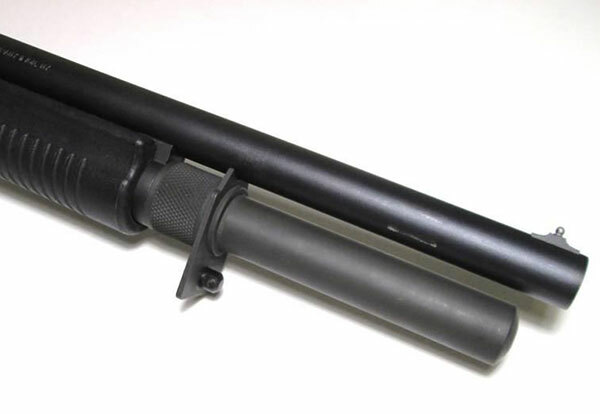 When installed on a standard 4-round magazine tube with a typical amount of thread engagement, the result is a total internal tube length of right around 17.5” from the forward shell latch to the end of the extension. 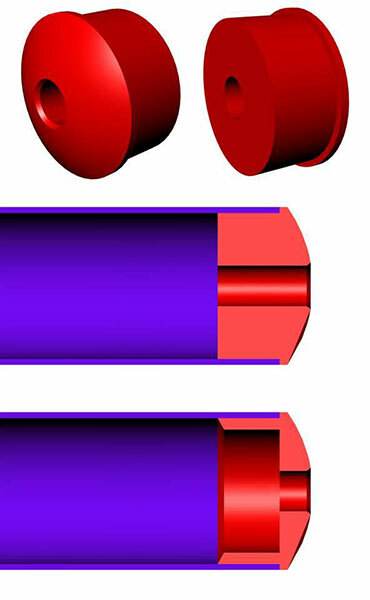 With 5- and 6-round magazine tubes, the total internal space should be about 20.81” and 22.25”, respectively. Fully compressed, the spring and follower (not counting the follower’s center post) take up about 1.65” of the space in the extension. That leaves about 15.85”, 19.16”, and 20.6” of space for the shells with 4, 5, and 6-round magazine tubes, respectively. So, whether it’s installed on a standard 4-round 870, a 5-round Pardner Pump, or a 6-round Express Tactical, this extension should easily provide enough space for two additional SAAMI-compliant 2.75” shells, which would conform to a maximum crimped length of 2.45 inches. It should also be a +2 with 3.5” shells (which have a SAAMI-specified 3.155” maximum crimped length) if installed on an 870 SuperMag, increasing capacity from 3 shells to 5 shells. 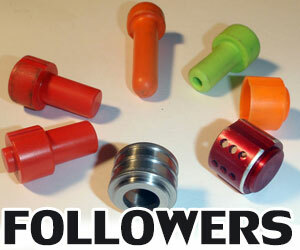 With 2.5” or short-crimped 2.75” shells, this extension can even act as a +3 without changing the spring & follower. That’s all good news, but things get a bit more complicated when it comes to 3” magnums. SAAMI specs allow a maximum crimped length of 2.76” for 3” shells, and magnum 870s can even handle slightly longer ammunition. However, a Wilson Combat +2 extension will not be able to fit six of any shells longer than about 2.64” when installed on a standard 4-round magazine tube. The maximum allowable crimped length for a +2 capacity increase with a typical 6-round magazine tube is even shorter at about 2.58”. So with some 3” shells, the Wilson Combat +2 extension will just be an oversized +1. I’ll emphasize that 2.76” is a maximum length, and many 3” loads will be short enough to allow a +2 capacity increase. Remington’s 15-pellet magnum 00 buckshot shells, for example, have average crimped lengths of about 2.52”. It’s also not at all unusual for +2 magazine extensions to have trouble accommodating long-crimped 3” magnums. So why am I dwelling on this with the Wilson Combat? Well if you’ve been paying attention, you may have noticed that this extension’s 5 5/8” of internal space is significantly less than its 6.25” external length; 5/8 of an inch less, in fact. This is due to the extension’s almost comically thick end cap, which is a solid (apart from the central vent hole) plug of steel extending almost 7/16” into the front end of the tube section. I cannot imagine any valid engineering reason for this end cap design; all it does is reduce capacity and add unneeded mass. I understand that the interior portion of the end cap needs to be long enough to bond securely with the tube, but hollowing out the center of the cap would have reduced weight and freed up more space while providing the same contact area. Yes, such a part would be slightly more complex to machine, but not by much. Besides, my Wilson Combat +1 (which uses the same basic design as the +2) has this style of end cap, so assuming the +1s are still made that way, why not just produce that single end cap variant for use in both +1s and +2s? To be fair, this magazine extension tube is intended primarily for combat/defensive builds, and will provide a +2 capacity boost with the 2.75” shells that are best suited for those applications. It may be a +1 with certain long-crimped 3” shells, but it will be a +2 with many others, and there is room to experiment with alternate springs and followers if you want to try to squeeze in longer magnums. Still, the engineer in me can’t help wondering about nonsensical design aspects like the thick end cap, which only reduces the capabilities and effectiveness of the product. A final note regarding capacity. 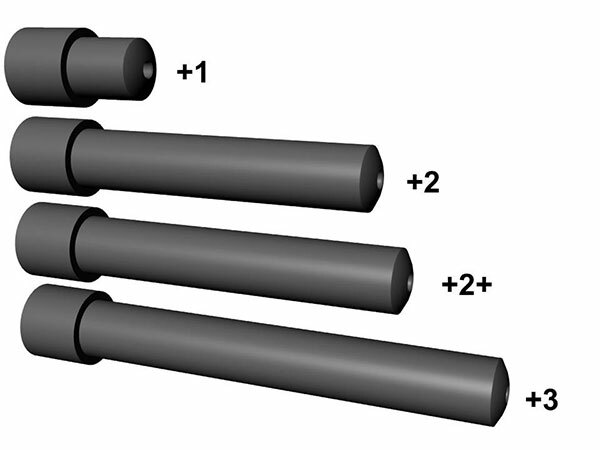 Exact numbers can be hard to predict with single-piece magazine extensions since the combined internal space of the extension & magazine tube is directly influenced by how far the extension is threaded onto the end of the magazine tube. I’ve compiled measurements for a variety of different shotguns and found .3” of exposed magazine tube thread to be about typical, but due to differences between individual factory & aftermarket barrels & receivers, this number can vary quite a bit. I’ve measured guns with as little as .23” and as much as .32” of magazine tube ahead of the barrel guide ring, and adding sling plates or other under-cap accessories can cover up an additional tenth of an inch or so of tube thread. If you want to know exactly how much space you’ll have to work with, you should measure your own shotgun and do the math. In order to provide a front sling attachment point, Wilson Combat +2 extensions are available with integral sling plates. These plates are held in place just forward of the extension’s base by a retaining ring welded to the extended tube section, and rotate freely about the extension so that they don’t interfere during installation or removal. When the extension is installed on the gun, the plate is held in its intended orientation by a radiused cut-out that engages the barrel. Four out of the five Wilson Combat +2 extensions come with sling plates (the fifth version just has a bare tube ahead of the base). Three sling plate versions feature simple loops located in bottom (called “vertical” by the manufacturer), right side, or left side locations for direct attachment of a sling. 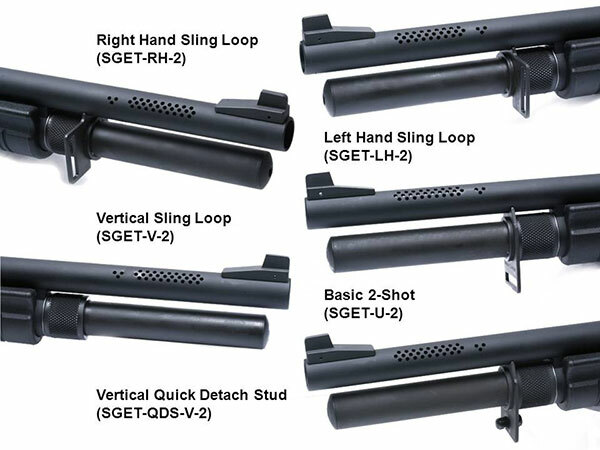 The names for the right- and left-side sling loops can be a little confusing; the loop on the “Right Hand” sling plate is located on the left side of the gun (intended for right-handed shooters), and the “Left Hand” loop is on the right side of the gun. The fourth type of plate – which came on the extension evaluated here – has a bottom-located hole through which a sling stud attaches with a polymer-insert locknut. Wilson Combat describes the sling stud as a “Quick Detach Stud”, but it shouldn’t be confused with push-button or clip-on quick-detach sling mount points, it’s just a standard sling-swivel attachment stud like those you’d find on most hunting shotguns and rifles. Because it attaches with a locknut, you can position the stud on either the front or back of the plate (I prefer the front, as it helps to space the sling out and away from the fore-end); and either tighten it, or leave it loose enough to rotate in place. The loop-style plates are best used with more-permanent slings that will not need to be quickly or frequently removed and reattached. The version with the bottom sling stud will accept the swivels that come on typical hunting slings, and pairs well with the sling studs built into the bottom of most factory 870 stocks. While it’s not as simple as a sling loop, it does make it faster and easier to attach or remove your sling as needed, and I’d tend to recommend it for hunting or defensive applications where you don’t want a sling swinging around when you’re actually shooting. The version without a sling plate would be the obvious choice if you don’t need a forward sling attachment point, or if you want to use an under-cap or clamp-on sling mount from another manufacturer. The concept with these sling plates is essentially the same as under-cap sling plates, which center on the magazine tube and index on the barrel the same way. 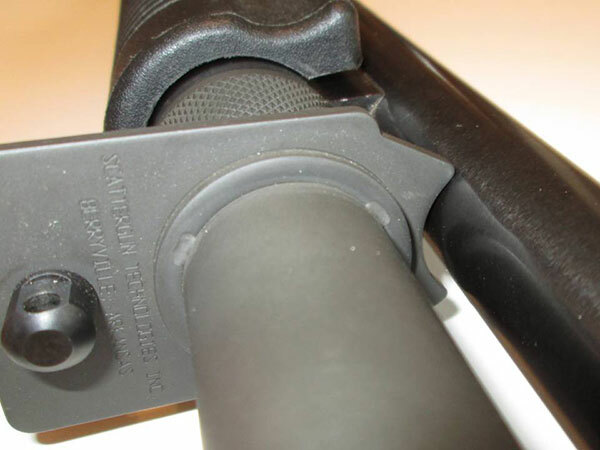 The key difference is that instead of sitting between the barrel guide ring and the magazine cap or extension, these plates are built into the extension. Thanks to this, these sling plates don’t complicate take-down & reassembly or reduce thread engagement (which weakens the joint and can potentially contribute to function problems) like under-cap sling plates do. However, they do retain some of the other issues associated with under-cap sling plates. A big one is barrel fit. There are a wide variety of barrels made for 12ga 870s, with differing outer diameters and spacing (center-to-center distance between the barrel and mag tube), so there’s no way to manufacture a plate that is a perfect fit to every 870 barrel right out of the box. If you make it too tight in an attempt to avoid a loose fit, it won’t be able to be used with many barrels without being modified. If you intentionally make it loose-fitting it’ll be compatible with a wider variety of barrels, but it’ll have a significant amount of free play with most. The Wilson Combat sling plates are apparently designed to fit standard-profile Police and Express barrels. When paired with my 18.5” bead-sight HD barrel or the 28” vent-rib Express barrel I use for trap shooting, the plate fits quite well with minimal free play. The same goes for the Pardner Pump and Express Tactical barrels I’ve tested this extension with. 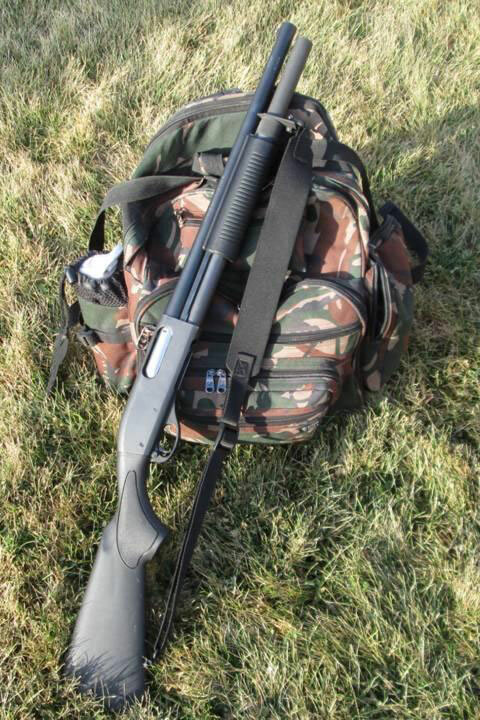 The fit is looser with my lighter-profile, higher-spaced 20” Wingmaster slug barrel, and the extra play makes the plate very rattle-prone. If you want to fit one of these plates under a heavy-wall barrel, on the other hand, you’ll probably need to do some grinding. If I was looking to regularly pair a Wilson Combat +2 with anything other than a standard Express/Police barrel, I’d probably go with the one that doesn’t have a sling plate. Another downside to these plates is that they’re permanently attached to the extension, and can only be oriented one way. Other manufacturers such as S&J Hardware and Vang Comp market extensions with similar sling plates, but theirs can be reoriented or removed for different applications. With the sling plates on the Wilson Combat +2, you’re stuck with just one orientation, and the only way to remove the plate is to permanently grind off the welds on the retaining ring. While allowing for easy removal would make the design of the extension more complicated, Wilson Combat could easily modify these sling plates to allow for different orientations by giving the plates multiple barrel cut-outs. It’s also worth noting that these sling plates can potentially interfere with fore-end-mounted lights, and the metal-on-metal contact can mar the barrel’s finish – especially if the plate has a lot of free play with that barrel. 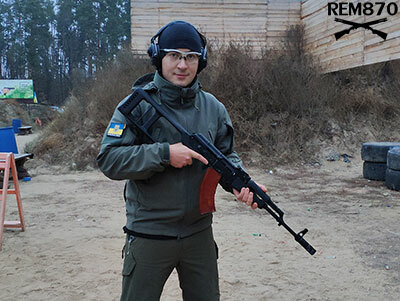 Finally, because the extensions are apparently finished after the sling plates have been installed, some users report issues with the plate sticking and refusing to rotate, thus preventing the extension from threading onto a shotgun. If this is the case with your extension, it should be easy enough to tap loose. All that said, I was more satisfied than I thought I would be with the QD stud sling plate on my Wilson Combat +2. The plate fits and functions quite well with standard barrels, and I really appreciate how the concept complements the single-piece design by keeping the extension just as simple and easy to remove or install as it would be without a sling plate. If a single sling attachment orientation meets your needs, and your barrel has the proper profile, these sling plates will work just fine. And if not, there’s always the option of purchasing the Wilson Combat +2 without a sling plate. 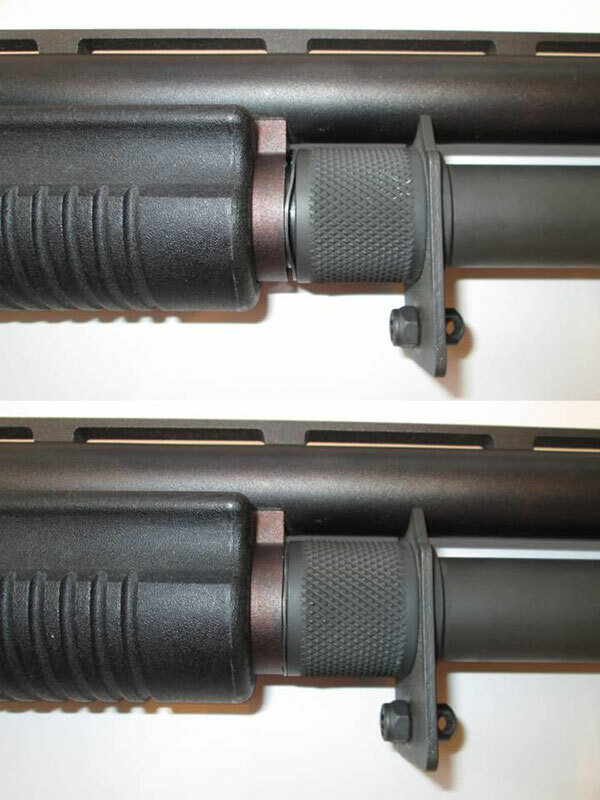 These magazine extensions feature a matte grey finish that isn’t specified on Wilson Combat’s website, but is described as Parkerizing on MidwayUSA. Parkerizing is a metal phosphate conversion coating that is popular on military firearms. Its matte appearance, decent wear resistance, and good corrosion protection (when kept oiled) makes it a good choice for this extension, and it can be used as a base for other gun paints or coatings if desired. The appearance of Parkerizing can vary depending on the exact process used, and the finish on the Wilson Combat extension is slightly lighter in color than Remington’s Express oxide finish or current factory Parkerizing. The difference isn’t major, but it is noticeable, especially under certain lighting. I have no problem with this slight color mismatch, and I doubt many will, but if you want an exact out-of-the-box match to a factory finish, you may want to look elsewhere. Color aside, the extension’s exterior Parkerizing is very smooth and uniform, absorbs and holds oil well, and so far seems to be fairly durable. 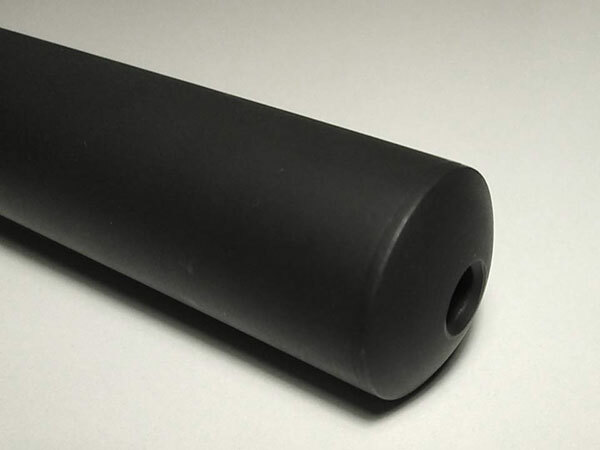 The finishing on the inside of the tube is not as nice-looking, but still seems perfectly serviceable, and will obviously not hurt function or appearance in the slightest once the extension is installed on a gun. Also, since the sling plates are apparently installed before the extension is finished, there’s some question as to how well the unexposed surfaces there are finished. I didn’t grind off the welds to check, but my Wilson Combat +1 has had its sling plate removed, and the underlying metal was clearly not finished like the rest of the tube was. If you choose a Wilson Combat extension with a sling plate and you’re working in a wet or cold environment, I would recommend working some oil into the spaces between the sling plate, retaining ring, and extension base to help displace moisture. Regardless of the version, Wilson Combat sells all of their +1 and +2 extension kits for a standard price of $45 (USD) each on their website. That price tag is a major selling point of the Wilson Combat extensions; $45 is near the bottom of the price range for Remington extension kits, but unlike many similarly-priced extensions, Wilson Combat kits are full-featured and have a good reputation for durability and reliability. 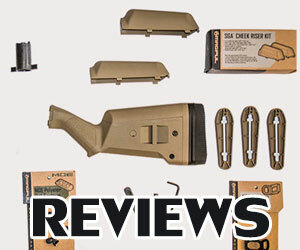 These magazine extensions can also be obtained from 3rd-party online retailers such as Brownells and MidwayUSA, or found on the used market. The +2 extension reviewed here was purchased from Brownells to take advantage of a promo code on a combined order. At the time of this writing, both Midway and Brownells sell Wilson Combat extensions for (essentially) the same standard price as the WC site, but they do not stock all versions. If you’re in the market for one of these, I would recommend visiting Wilson Combat’s website first to identify the kit that best meets your needs, and then check 3rd-party sellers if you want to try to find a better deal on that particular kit. Wilson Combat is currently holding a holiday sale in their website, with $4.50 or $9 discounts available for certain extension kits. These discounts will reportedly run through Christmas 2014. Combined, the Wilson Combat +2 extension tube, spring, follower, and sling plate with sling stud weigh in at about 9.2 ounces. I didn’t grind off the welds to weigh the sling plate on its own, but based on the dimensions of those parts and the density of typical steel alloys, I estimate that the plate, sling stud, nut, and retaining ring add roughly 1.5 ounces to the total. The simpler loop-style sling plates appear to be somewhat lighter than the QD stud version evaluated here, and the extension without any plate should be the full 1.5 ounces lighter. If any readers have a different version of the Wilson Combat +2 that they can weigh, I’d appreciate it if you could relay that weight in the comments below. 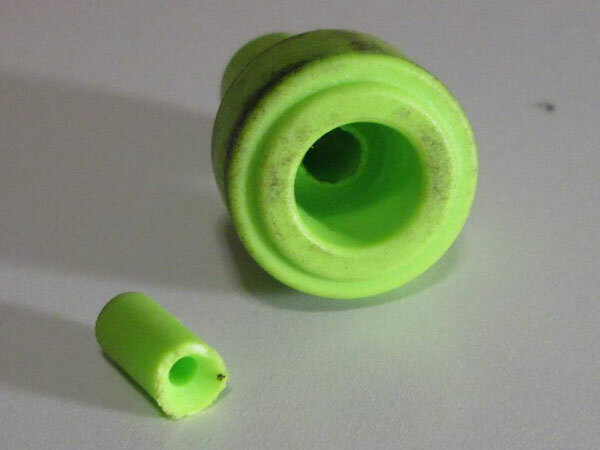 Assuming you’re replacing a typical magazine cap, spring retainer, 4-round spring, and factory polymer follower, expect these extensions to increase your gun’s unloaded weight by between 7 ounces for the QD stud version and (roughly) 5.5 ounces for the version with no sling plate. This figure can obviously vary slightly depending on the specific parts you’re replacing, and a handful of other variables. The Wilson Combat +2 extension kits are hardly featherweights, and keeping the mass down was clearly not a design priority. I will admit that the extra heft is somewhat appealing, but the engineer in me can’t help but realize that the extension’s chunky cylindrical base, wide QD sling plate, and overly-thick end cap could all have been lightened considerably without meaningfully reducing the strength of the magazine assembly, or harming function in any way. Still, few would call an extra ounce or two a deal-breaker, and if the simplified part design is what allows Wilson Combat to offer these extension kits at that very appealing $45 price point, I would consider it a reasonable trade-off. I’m sure someone will point out that a heavier firearm will kick less, and while it is true that free recoil energy is inversely proportional to the gun’s total mass, adding or removing an ounce or two will have a negligible impact on the total mass – and thus the recoil – of an 8- or 9-pound gun. Besides, even if you did want to add mass to your 870 to soak up recoil, a defensive/combat gun will tend to handle better if that mass is added to the receiver or stock, rather than out near the muzzle. As an extra plus, Wilson Combat magazine extension kits come with a wave-style lockwasher that can be placed between the magazine extension and barrel guide ring to help secure the extension on barrels that don’t have magazine cap detents. By functioning as disc springs, these washers significantly increase the friction in the joint, and can maintain that friction even if the extension backs off slightly. This is a very nice bonus since many newer 870 barrels lack the magazine cap detents that single-piece extensions usually rely on to stay in place under recoil. Compared to a reinforcing clamp, a wave washer is much simpler, lighter, and more in-line with the advantages of single-piece extensions. For hunting or sporting shotguns that are being converted to pull double-duty as HD weapons, the included wave washer has another benefit. Most current-production hunting or competition 870s, as well as the Pardner Pump clones and long-mag Express Tacticals, have switched to the new-style internal-ratchet cap retention system with plastic spring retainers that lock into stamped dimples in the end of the magazine tube. Once the dimples have been removed to allow a magazine extension to function properly, the new-style spring retainer can no longer secure the magazine cap. In this situation, the wave washer can be used to keep the magazine cap tight when the gun is switched back to its original configuration. These washers are just .03” thick when compressed flat, so they don’t contribute much to the length of the extension, or to its internal gap. They do add another thing to keep track of when you take your gun apart though, so for that reason alone, I wouldn’t recommend using this washer on barrels that have magazine cap detents (unless you’re using the washer with some other flat-bottom magazine cap or extension that can’t engage the detent). If you need replacements or want to use one of these washers with a different cap or extension, they can be purchased separately from Wilson Combat’s website for $3 each. 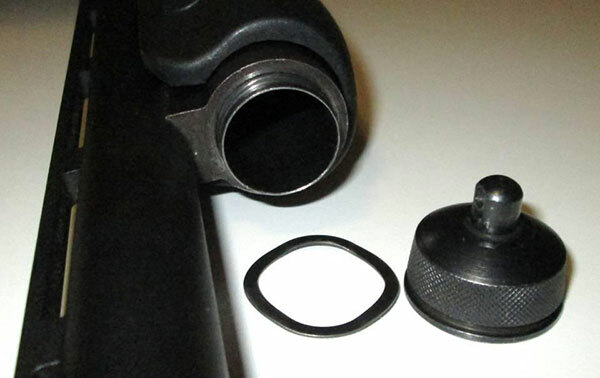 Before installing any magazine tube extension kit, you must first remove the gun’s magazine cap (or extension), spring retainer, magazine spring, follower, and magazine plug (if present). If the gun has dimples in the magazine tube, these will have to be drilled or pressed out for the extension to have its full capacity. If your extension has a sling plate, make sure it is able to rotate freely in place before trying to install the extension. If it’s stuck, tap it loose with a non-marring object like a plastic hammer or a scrap piece of wood. 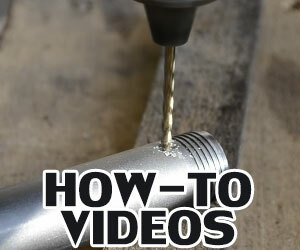 If you want to remove the follower’s center post, place the follower against the side of a tabletop or other sharp-cornered item with the end of the post on top of the corner, and apply steady downward pressure to the follower to snap the post off. 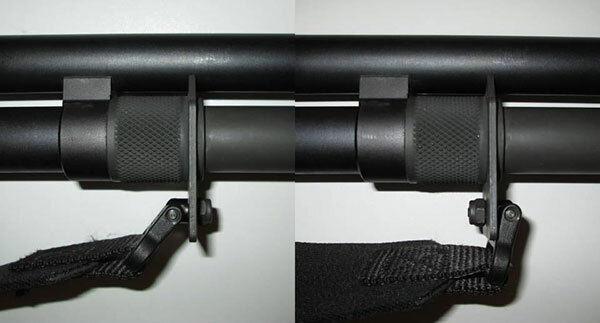 To install the magazine extension tube, ensure that the barrel is properly seated in the receiver, and insert the new follower and extension spring into the magazine tube. Place the extension over the end of the spring, make sure the sling plate (if your extension has one) is properly aligned with the barrel, then thread the extension onto the magazine tube. If you’re having trouble controlling the rather long Wilson Combat spring, you can insert a thin rod through the hole at the end of the extension to keep it aligned. Finally, tighten the extension down firmly against the barrel guide ring. 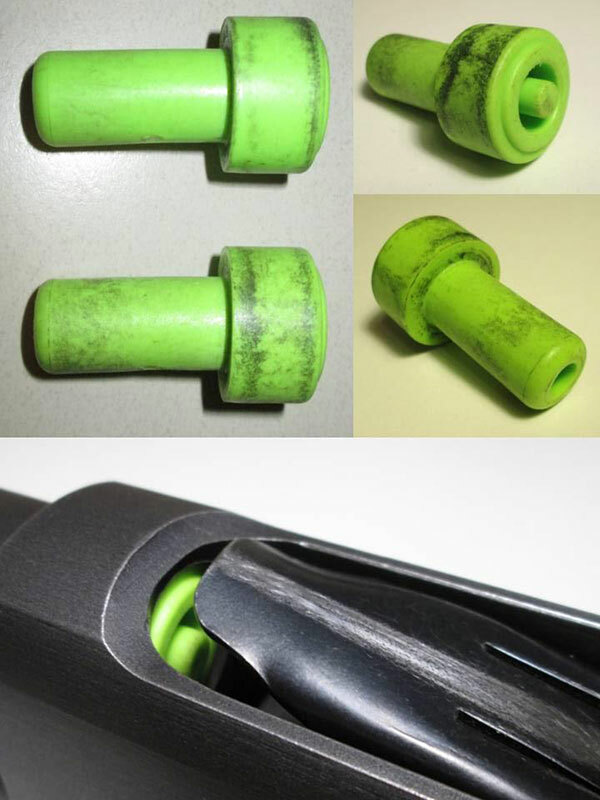 If your barrel does not have a magazine cap detent in its guide ring, install the included wave washer between the barrel guide ring and the base of the extension (this is best done before inserting the magazine spring), and tighten the extension down until the washer is pretty much flat. If there is a detent in the barrel guide ring, or you’re securing the extension to the barrel with a reinforcing bracket or clamp-on accessory, you do not need to use the wave washer. 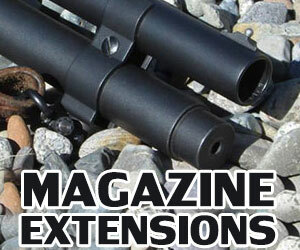 The function of any magazine extension revolves around its ability to reliably accept and feed shells. I tested the reliability of the Wilson Combat extension/follower combination by threading the extension onto a spare magazine tube with .2”, .25”, .3”, and a maximum 11/32” of thread engagement, inserting the spring and follower, and working the follower back and forth across the internal transition using a 7/8” wooden dowel with one end cut about ten degrees from square. 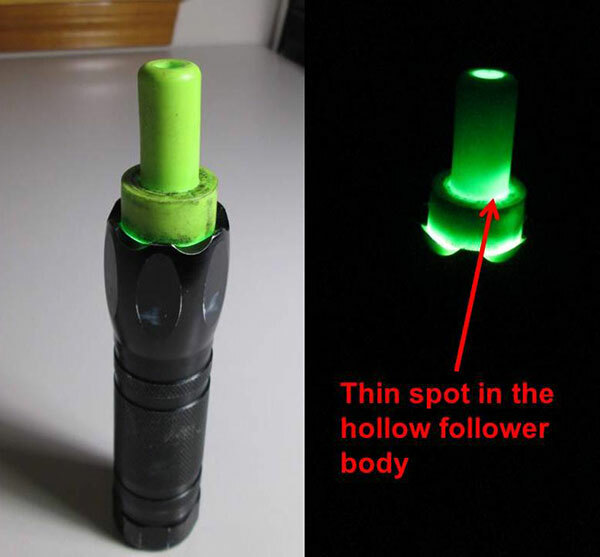 The angled end of the dowel serves to cant the follower inside the magazine tube, giving the best possible chance for the follower to snag at the internal gap between the magazine tube and the extension. Initially the Wilson Combat follower functioned almost flawlessly, only experiencing a bit of very minor snagging with a short .2” of thread engagement. This was suspiciously good performance considering the less-than ideal interface of the single-piece design and the sharp rear edge of the follower’s body. Further investigation revealed that the follower’s raised center post was the only contact point between the follower and the angled end of the dowel, so the follower was not actually being canted in the tube (most shell crimps are recessed in the middle, which would negate this effect). Repeating the test using a follower with the center post removed produced more realistic results. During simulated loading and feeding with the angled dowel, the follower had a tendency to snag firmly at the transition, and this propensity increased as thread engagement was reduced. With a minimal .2” of thread engagement, it became very difficult to get the follower past the gap and into the extension without hanging up. Another potential problem was revealed when I tested function with actual hulls. 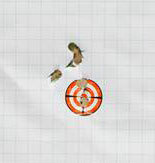 Unless the magazine tube was threaded as far as possible into the extension (which will not normally be the case when the extension is installed on an actual shotgun), the rim of the foremost shell would occasionally catch on the edge of the magazine tube, halting feeding until it was shaken loose. So does this mean the extension or follower isn’t reliable? I wouldn’t say so. Yes, I was able to cause hang-ups with an angled dowel in a simulated magazine setup, but while cycling and shooting actual shotgun shells with the extension installed on an actual shotgun, I never experienced a single hiccup. My dowel test has caused hang-ups of some kind with every extension/follower combo I’ve tested so far, especially when the extension was a single-piece. This test is more focused on examining the nature and severity of hang-ups than it is on predicting their likelihood or frequency. I’ll also point out that the worst hang-ups I was able to cause occurred during loading; feeding hang-ups were considerably less common and severe even during worst-case testing. If they do occur during real-world use, these feed jams probably wouldn’t even be noticed, as the mechanical perturbation of firing or cycling the gun would likely be enough to shake things loose. 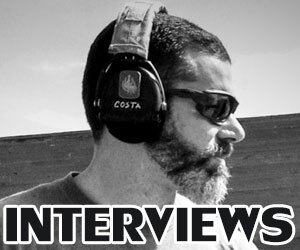 Realistically, for a defensive or combat shotgun, it’s feeding that really needs to happen reliably in life-or-death shootings; a rare, minor snag when loading poor-quality shells can be tolerated. 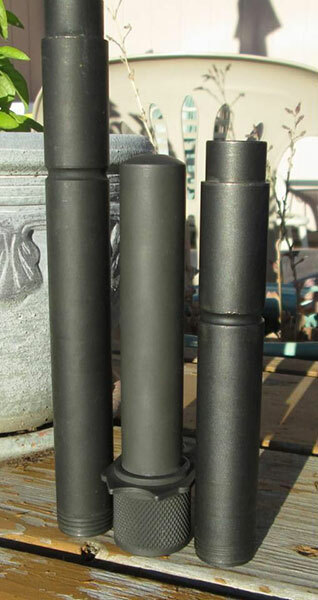 Finally, while I feel they could be improved, the Wilson Combat follower does fit well and show a good ability to stay aligned in the tube, and the extension does not have an excessive engagement length or an especially abrupt internal transition – as is the case with some other single-piece extensions. I would advise against using under-cap accessories with this extension to help keep the internal gap to a minimum, and recommend avoiding deformed or poorly-crimped shells when maximum reliability is desired (which is really a no-brainer, if we’re honest). With those steps taken, hang-ups of any kind should be practically non-existent during normal loading and cycling, and I feel I could trust this extension to do its job reliably even when the stakes are life-and-death. Another major reliability consideration for any magazine extension is whether or not it can stay in place under recoil. 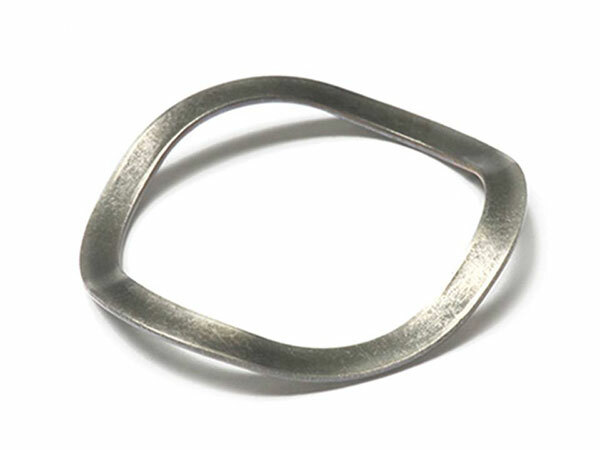 Single-piece extensions also start out with a bit of a handicap here compared to two-piece designs, as they are generally expected to be able to stay in place without the aid of a clamp. Shooting both standard 1 1/8-ounce, 3 DE target loads and full-power buckshot loads, I tested the Wilson Combat +2 with two different barrels; one with a magazine cap detent, the other with no detent. With the latter barrel, I tested the extension both with and without the wave washer. As expected, the extension’s factory-style detent dimples kept it very secure on the barrel with the magazine cap detent, and the wave washer seemed to do its job quite well on the other barrel, with no apparent movement of the extension. The real surprise came when the extension stayed put on the detent-less barrel without the wave washer. I chalk this up primarily to the barrel expanding as it heated up, but it certainly didn’t hurt that the excellent knurling on the extension’s base let me tighten it down very firmly before shooting. I may have seen some loosening if I had let the barrel cool down between shots or fired a much larger quantity of shells, but that’s not terribly realistic given what this extension is intended for. In home/woods defense, law enforcement, and security roles, shootings tend to happen fast and end fast, with small numbers of shells fired and little time between shots for things to potentially cool down and loosen up. For hunting or recreational shooting where shots may be higher in number and less frequent, it’s no problem to occasionally reach up and make sure the extension is still tight. While I would recommend using the included wave washer if your barrel doesn’t have a magazine cap detent, I would have no problem trusting this extension to stay in place well enough without it for most real-world applications (high-volume competition shooting being a possible exception, but I would recommend a lightweight, higher-end extension kit for a competition build anyway). Now, I didn’t have the time or money to give each setup a robust 1000-round torture test, but between my encouraging results and the excellent reputation these extensions have in hard-use law enforcement roles, I have little doubt about a Wilson Combat extension’s ability to stay in place in action. •	A variety of options for sling plates, including a lack thereof. But while I could probably triple this review’s word count going into all the ways I think these extensions could be improved, as they are now, they work. They’re sturdy, fairly reliable, easy to install, give you a decent number of options for attaching slings and other accessories, and come with everything you need included in the kit. They’ll give you a +2 capacity increase with most shells, work with just about any 870 or 870 clone, and allow you the freedom to experiment with alternate springs and followers if you so desire. And they do all that for a very competitive price. If someone came to me looking for a way to boost the capacity of their home defense or truck shotgun with minimal expense and headache, a Wilson Combat kit would probably be the first thing I’d suggest; and it would likely be the last thing I’d have to. With the single-piece design and included wave washer, I’d also be quick to recommend this extension and a basic 18” or 18.5” barrel to anyone who wanted a quick and easy way to convert a sporting 870 into a defensive shotgun when they weren’t hunting or competing with it. The Wilson Combat +2 extension is an excellent bang for the buck, and my favorite single-piece +2 so far. It’s simple & easy to use, does what it’s supposed to, and I don’t have to treat it like glass or worry about it falling apart under recoil. Though I have some other higher-priced +2 extensions I could use, I predict that the Wilson Combat is going to be spending the most time on my 870 for the foreseeable future. Wilson Combat’s follower’s center post is easily reversed and epoxied into the thin spot between the tail and the followers head once it’s broken off! I cleaned up the hole in the end of the follower with a dill bit and then the broken off post easily slid into place. A quick test fit followed by a bit of epoxy made this area quite a bit thicker!